Scott wears: Aviator sunglasses from Next, printed white t-shirt and black cardigan from River Island, jeans from River Island and purple double tounge hi-tops from Converse. Fave thing about Bristol: Summer festivals and drinking in the sunshine. 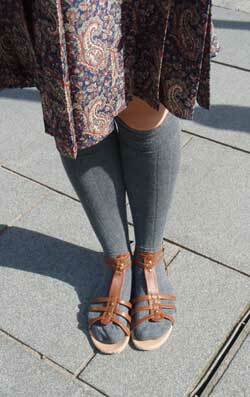 >Hmm… I’ve always had strong feelings about the socks under sandals look and none of them were good! A favourite of male, beach-loving holidaymakers of a certain age, I had always thought the look was as outdated as wearing a handkerchief as a sun hat. All that changed however when I dug out my treasured over the knee grey socks (from M&S of all places) for a shopping expedition yesterday. The silver ballet pumps I was originally wearing were hurting my feet (as always) despite the socks acting as a buffer, so I made a pit-stop at home to change. The brown tan gladiator sandals may only have cost £4 from Primark at the start of summer, but they are one of the comfiest pairs I’ve ever owned and were calling out to me. I was undecided about the gladiator sandal debate you see, despite them looking amazing on everyone else. I though they would cut into my delicate feet like a knife and was certainly not going to spend £60 on a pair of ‘Helena’ sandals from Office, gorgeous as they may be. Anywho, these cheap-as-chips sandals turned out to be super comfortable and my staple summer footwear so I thought I might as well just try them on over the grey socks. And who would have thought it!? 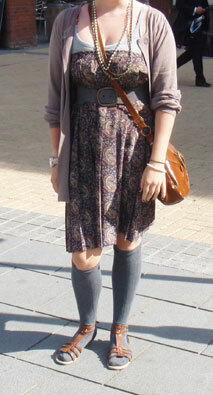 The combo looked pretty darn good, especially with the librarian/granny chic look I was modelling, see above and right. I must admit that the feel of the socks underneath sandals did take a bit of getting used to, which a friend and co-shopper will attest to. But after a few laps around Cabot Circus I felt totally comfortable and not at all dowdy or elderly! Of course this would have been a totally different look if I were actually on the beach or wearing white sports socks etc. but so long as you proceed with caution, of the socks vs sandals debate I say ‘just do it’. Try out a few different sock/sandal combos at home and if you still don’t feel comfortable then go out and buy a pair of loafers and team with the socks, a la Alexa Chung: cute, practical and not at all ageing. > Oh to be Susanna Lau, aka Susie Bubble. As famous as her fashion blog, Style Bubble, Susie, with her long, raven hair and quirky fashion sense, has become something of a fashion icon since the launch of the blog back in March 2006. Thanks to the consistent and candid fashion updates and self portraits of her ever-changing outfits, Susie gets around 15,000 hits a day from across the globe. Not bad for a 24 year old ‘fashion outsider’ from London. I must admit to having a bit of Bubble envy but as this post is Blog of the Week I’ll stick to the blog rather than the creator! In an interview with The Business of Fashion, in 2007, Bubble admitted the blog is something of a ‘selfish endeavour’ to ‘present what I see and how I feel [about fashion]’. 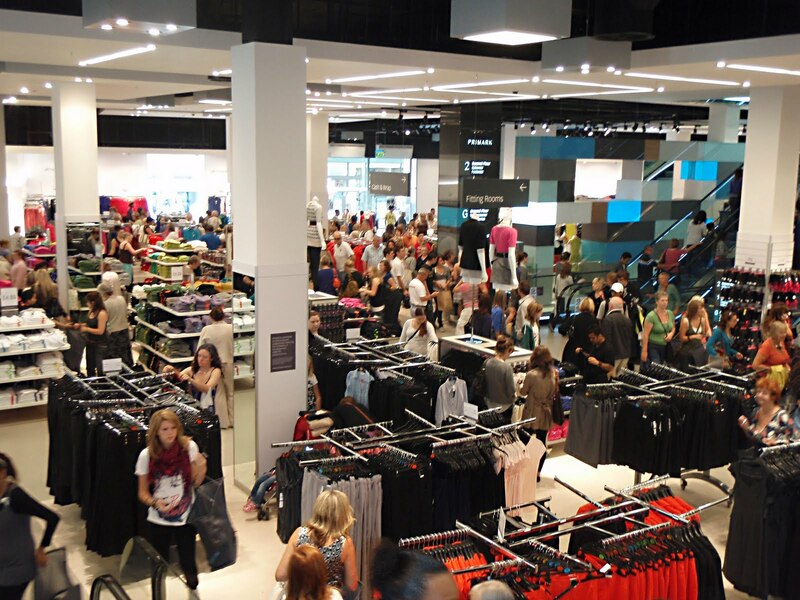 Selfish it may be but this genuine passion for fashion and love of clothes only makes the blog better as regular followers dip in daily to read what Bubble has to say about new shops, styles and designers. With such a wide readership Style Bubble has become hugely influential, not only to civilians and fellow bloggers but also fashion insiders such as designers, who often send Susie front row tickets to their shows. The blog has evolved to include lengthy press cuttings, an amusing FAQ and even a Google Map dotted with the best places to shop, from designer to market stall. The design of the site is cute and the content comprehensive: Bubble brings a wit and personable approach that is sometimes lost within the seriousness of the fashion industry. She may be a fashion ‘darling’ but she certainly doesn’t write like one: her blog is passionate and positive, self depreciating and quirky. Despite her iconic status and busy day job, Bubble also find the time to respond to the numerous comments that readers leave, showing she cares about their input and questions. 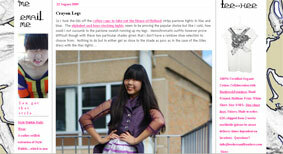 A great example of a blog and a must-read for any fasionista interested on being ‘a fashion outsider looking in’. 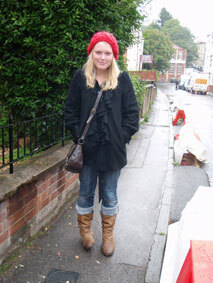 Shelley wears: a red chunky knit beret from Topshop, black frilled coat with puff sleeves from Primark, jeans by Criminal from Khoi, brown leather boots and chocolate brown leather shoulder bag both from Next. Fave thing about Bristol: The music scene and my new flat! Mastershoe has been a permanent fixture on Park Street for years but now it’s sister shop, Sportshoe, on Union Street is closing down. The south west shoe emporium run by Giles UK Ltd has stores in Bath, Bristol and Trowbridge but can no longer keep one of the longest runing stores open as ‘rent and buisness rates are at a level at which we can no longer trade here profitably’. 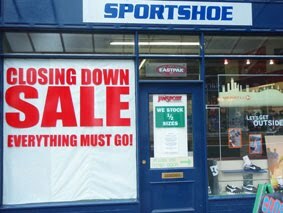 Sportshoe is currently running a fairly decent closing down sale and will open it’s doors for the last time on 31st August. The staff are a friendly bunch and know what they’re talking about so if you’re after running shoes or streetwear trainers then pay the place a visit before it closes in a weeks’ time. Other Mastershoe and Myshu stores in the area will continue trading as normal. As with any trend you might be a little unsure of, accessories provide the perfect fashion pool to dip your toe in, without getting soaking wet. If you’re unsure of how vintage/granny chic will look (or how to convince granny to give up the goods) then a pair of shoes or printed scarf are a great place to start. Chances are that your old lady friend will have accumulated a fair few scarves, bags and pairs of shoes in her time, whether she has an interest in fashion or not. Once again it is a likely bet that the accessories in question will have been kept neatly in their original boxes/packaging, keeping them in good condition. 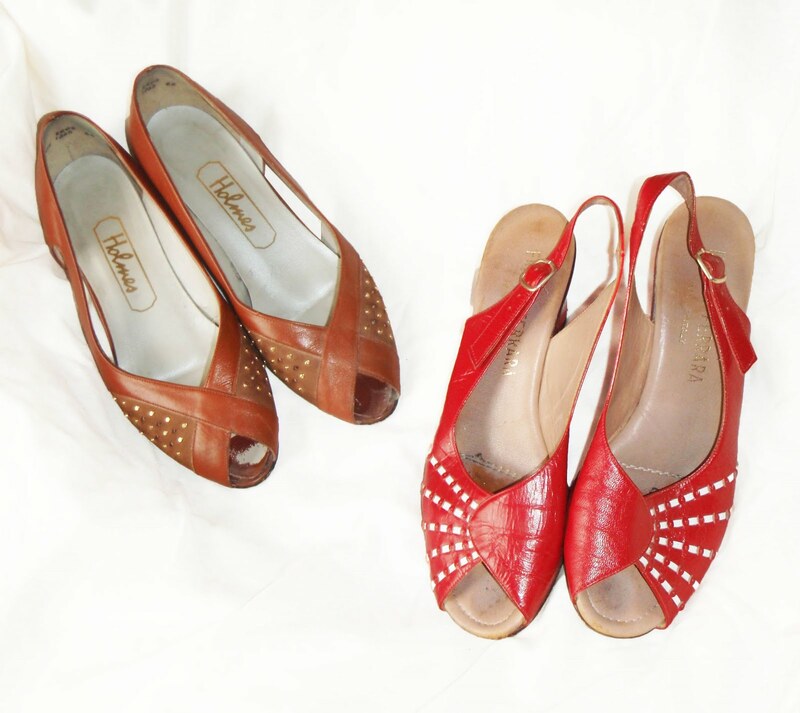 Shoes – can be a great find if you and granny are a similar size though be warned: shoe that are more than 30 years old are likely to be slimmer across the ball/toe than what you might be used to. If you have wide feet or ankles then this might be an accessory you have to miss out on. This tan leather shoes, far left, are a key example and require Party Feet and a large quantity of alcohol to wear comfortably! 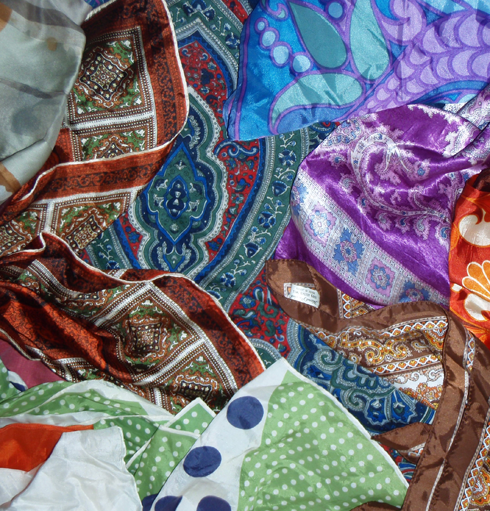 Scarves – printed, woven, wool or silk; a decent square scarf is the multi-tasker of the accessory world. Tie it round your neck for a 50’s air hostess look or tie through the handle of a tired looking bag for instant fashion refreshment. You could of course always drape one around your neck and shoulders when cold! My personal favourites are brightly coloured paisley prints on silk, above. 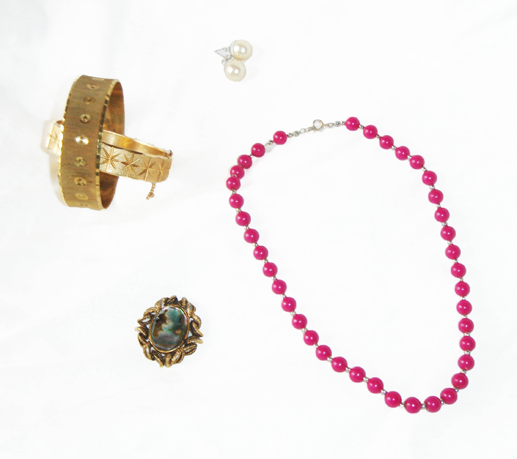 Jewellery – Depending on her taste, your gran may have anything from pearls to pewter in her collection. If you like decorative, costume jewellery then you may be in luck. An example of what my elderly fashionista has given to me can be seen above, right, and includes some plastic fuchsia beads (great for daytime), a beautiful stone brooch inset into tarnished gold (perfect for smartening up hats and lapels) and some trashy gold bracelets (great for adding a bit of bling on a night out). Bags – leather clutches and small, evening bags are all the rage right now and granny may well have a couple she wants to get rid of. Be sure to look out for detailed clasps and a decent lining. Be sure to give back anything your granny may have left inside her bag as although you admire her style, you probably don’t have much need for lace handkerchiefs and plastic combs! 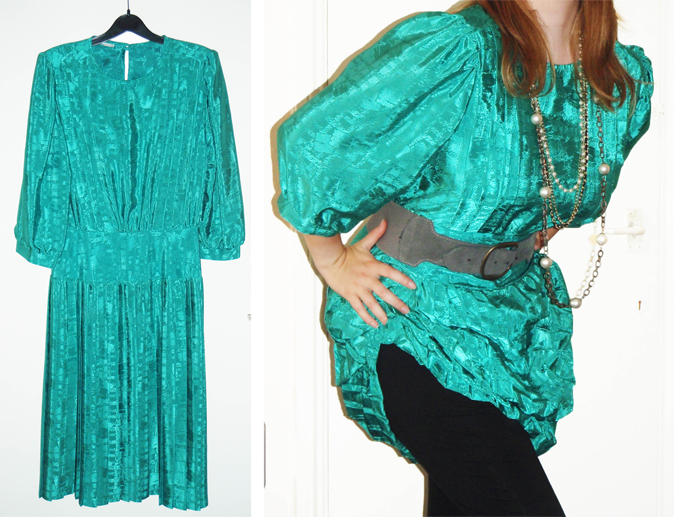 > Vintage clothes have always been on trend, whether they are inspiring new designs or being worn at awards ceremonies by film stars. In Bristol shops such as Billie Jean, Repsycho and La Freak Boutique mean the vintage look is easy to acquire. However, there may be one place you have overlooked on the hunt for the perfect vintage dress, and that would be your Grandma’s wardrobe. Nan, Granny, Grandmother, Nana: whatever you call her she probably has a goldmine of clothes waiting to be discovered in the back of her wardrobe. Despite the fact that my own elderly relative only ever seems to wear the same three worn out dresses, I have been pinching her clothes, scarves and shoes for years. Dresses from the 80s that have been passed between mother, daughter, sister and cousin often seem to find their way into the care of my Nan, who always looks baffled when I ask to try them on. And the best thing is that there are so many benefits of pinching some of Grandma’s cast-off’s (emphasis on ‘cast-off’s’: I am not implying that you rip the vintage shirt off her back). For starters, you can probably get said cast-off’s for free which is always a bonus. Not to mention the fact that not only will your garment have a history, but you’ll have someone on hand to tell you all about it. You granny will probably have kept her clothes in good condition and stored them carefully, not covered them in cider and black on a night out before throwing them on the floor. Finally she will almost certainly be; a) flattered that you’ve asked her in the first place and b) really rather chuffed that you want to wear her clothes. So, once you’ve got you hands on the goods, what should you do with them? Well, one of the easiest things to do is accsessorise with your own jewellery, belts, bags and shoes to make the look your own, above. If you get landed with a print that you love in a style that just isn’t you. A vintage purist would tell you not to cut up a dress or skirt but if you think that you can rework it into a style that you wear all the time then I say go for it, though if in doubt of your sewing skills consider taking it to a tailor. If you don’t want to involve a pair of fabric shears then try wearing those dodgy polyester skirts with elasticated waist bands as a dress, above. There is no way I would have worn this pleated skirt in its original state but I loved the pattern so slipped it on like a bandeau and used a waist cinching belt to give it some definition. 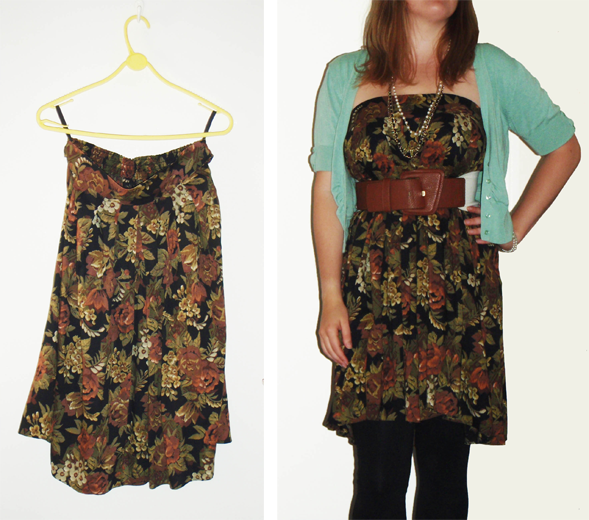 Add some leggings, a fitted cardigan and some jewellery and voilà, a dress fit for day or night. This is a look that I have been wearing for a few years now and have seen other similar outfits in Cabot Circus for twice the price. 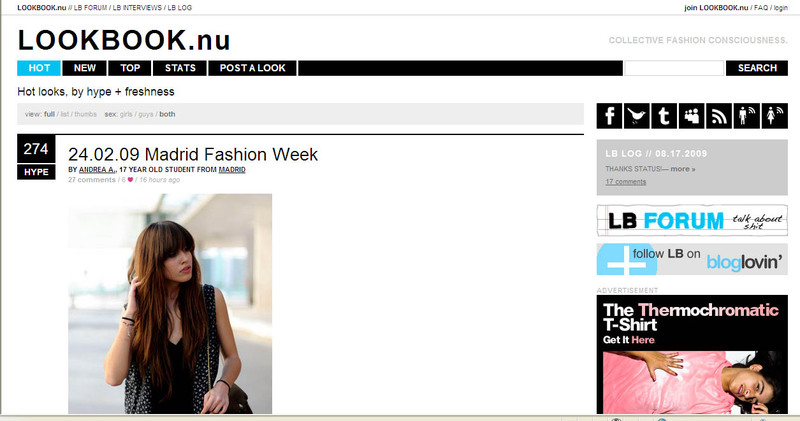 LOOKBOOK.nu is a style blog that I recently stumbled across and it is strangely addictive. Claiming to be “an international social experiment is style”, allowing users to upload photos of themselves in their most fashionable outfits and rate each others ‘looks’. After filling out an online application form, fashion-forward followers from around the world can post pouting pictures of themselves in vintage finds, designer pieces and high street brands. They can then ‘hype’ one another, the blog’s version of a fashion high-five, bumping their profiles up the ‘karma’ list. Viewers and followers alike can search the vast collection of images for style inspiration and many of the photographs look like they could have been lifted from the pages of Vice magazine or the original fashion blog, The Satorialist. As well as latest posts, you can also search images by country, label or catagory, such as belts, dresses or hats. Popular with students and school kids, the blog is a great example of street fashion, despite the contrived nature of some of the shots. If you’re in need of a real life style kick then check it out. 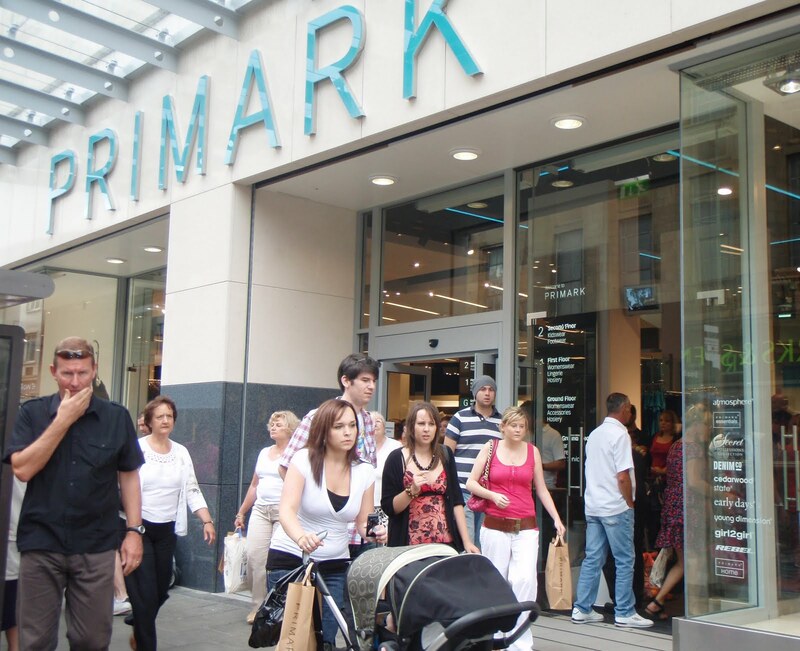 >Primark: The Crown Jewel of Broadmead? 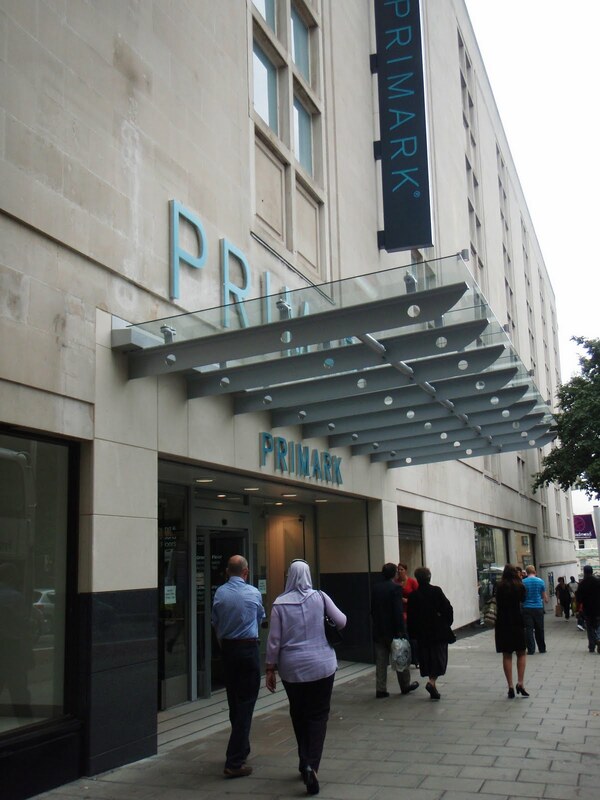 >Since the opening of Cabot Circus exactly twelve months ago, with its grand, curving glass structures and lengthy list of upmarket shops and eateries, neighbouring Broadmead has been left somewhat in the shadows. ‘Closing down’ signs and ‘everything for a pound’ shops are springing up everywhere, taking the place of a once thriving, if slightly outdated shopping district for many Bristolians.